or what kind of wood would a wood chip chip…. Heritage Flower Farm uses LOTS AND LOTS of wood chips. They are free (chase wood chip trucks, ask your municipality, or make friends with a tree guy. Thank you Calvin, our tree guy). They add organic matter to the soil, over time as they disintegrate. They help retain moisture in soil, reducing watering, and evaporation. They make you feel virtuous by recycling. They reduce winter frost heave in plants because they moderate soil temperature. They can be spread in fall when you’ve got time, as though a gardener ever has extra time, well, when you’ve got a little time. In fact mulch saves time weeding and watering. To make paths for walking without tracking dirt. To cover between rows of plants. To start a new garden. For these three we first kill or remove the grass, then cover the ground with a layer of four+ pages of newspaper (not the shiny stuff) or cardboard. This means collecting and storing it in anticipation – you know- the boxes you get from mail order. Or go to Walmart early in the morning and, don’t be shy, ask the people stocking shelves if you can have the empty boxes. Lay the paper/cardboard and then spread at least an inch of wood chips on top of the area. Hint: lay the paper/cardboard on a day with no wind. For a garden you can make planting holes through the paper/chips. You won’t believe what good tilth this gives the soil. Make a circle around the shrub/tree removing or killing the grass. The circle size depends on the size of the tree/shrub. The bigger the better, within limits. This prevents equipment damage to the bark and makes it easier to mow, as well as improves moisture to roots. IMPORTANT: DO NOT MAKE A VOLCANO AROUND THE TRUNK. Keep wood chips a couple of inches away from the trunk. Why? Wood chips retain moisture. Moisture around the trunk will kill the tree, maybe not this year but give it time. We lay a layer of wood chips in flower beds. We don’t want to smother the perennials. And we want some flowers to drop seed and make babies. Of course this means weed seeds too. It’s a balance. Notice I said flower gardens. 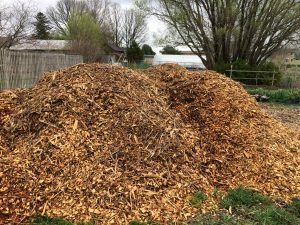 We use any wood chips – fresh and composted depending on what’s available. See below under nitrogen. 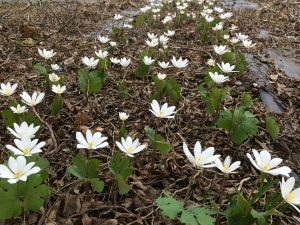 Blood root growing in garden mulched with wood chips. See Ma, no weeds. Nitrogen. Wood chips are chipped up trees. Trees are made of carbon. (That’s why we should plant more trees, to capture carbon and reduce climate change.) Carbon in fresh wood chips is released, some into the air and some into the ground. This release reduces nitrogen in the soil to a depth of a few inches. Plants need nitrogen in different amounts. Vegetables are needy and annual vegetables have shallow roots. Most perennials have deeper roots. Morals of the story – you can safely use wood chips that are a year old anywhere. You can safely use fresh wood chips on most perennials, we do it without effect. It’s better for the vigor of your vegetables not to use fresh wood chips on them. Wood chips from diseased trees. Many diseases are specific to that plant – example, Dutch elm disease impacts elms; Ash borers only bore into ash trees, not Roses. I have read that wood chips from diseased trees are not a problem in flower gardens. We have not encountered a problem. Wood chips from walnut trees. Walnut trees carry juglone, a poison to many other plants – pretty clever, reduce competition. Walnut is a valuable wood, so walnut trees are usually made into wood planks, not wood chips. I have read that walnut wood chips do not harm other plants. Don’t let the elephants stop you from this valuable material. Its values far outweigh the elephants, if any, and that’s a lot of pounds.